Spring is in the air, not to mention the supermarkets, farmers markets and vegetable stands. A good reminder that we should be eating the fruits (and vegetables) of mother nature’s labour. Eating in season seems to be the one recommendation all diets can agree on. Whether it’s the vegan, paleo or Mediterranean diet, they all suggest getting your fill of seasonal veggies. From a macrobiotic perspective, eating in season is extremely important for balance. When you eat according to the seasonal and/or climate conditions, your are in harmony with the environment around you and your body performs at its best. And so, as the seasons change, our diets should follow. I kind of liken it to taking your car in for a seasonal tune up. What works for your body in the summer, won’t necessarily work in the fall or winter and vice versa, so make the necessary adjustments for optimal performance. Most fruits and vegetables are now available to us year round, but its not always ideal for us to consume them all year long. Some foods are extremely cooling and help our bodies stay cool in the summer months, while others are warming, and help us stay warm in the winter months. Ideally we should be eating fruits and vegetables that grow naturally in the local environment and season in which we find ourselves. I’ll be the first to admit that I’m guilty of buying veggies like zucchini in the winter when they are not in season, but I’m not perfect and I do my best. Besides warmer weather, one of the things I love most about spring is the variety of fruits and vegetables on offer that we don’t see during the winter months (and when we do see them they are frozen…but lets face it, its just not the same). One such vegetable (or legume in this case) is fresh Peas in a pod which are loaded with nutrients, like Vitamins A, B6, C, K, thiamin, riboflavin, niacin, folate, iron, potassium, antioxidants and fiber. They are extremely easy to prepare and can be blanched for 2-4 minutes or steamed for 4-5 minutes. They also go well in many dishes, from soup to salad to pasta and more. Another favourite vegetable of mine is carrots. While carrots are harvested year round, they were once predominantly a summer vegetable and so tend to be at their best jn the summer and fall. Carrots are packed with vitamins A, C, K; potassium, alpha- and beta-carotene antioxidants and fiber. 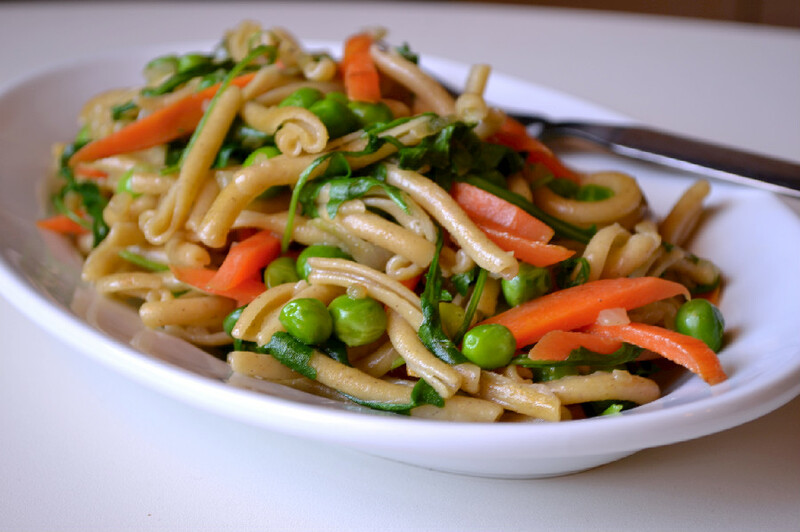 It just so happens that peas and carrots go extremely well together in many dishes. 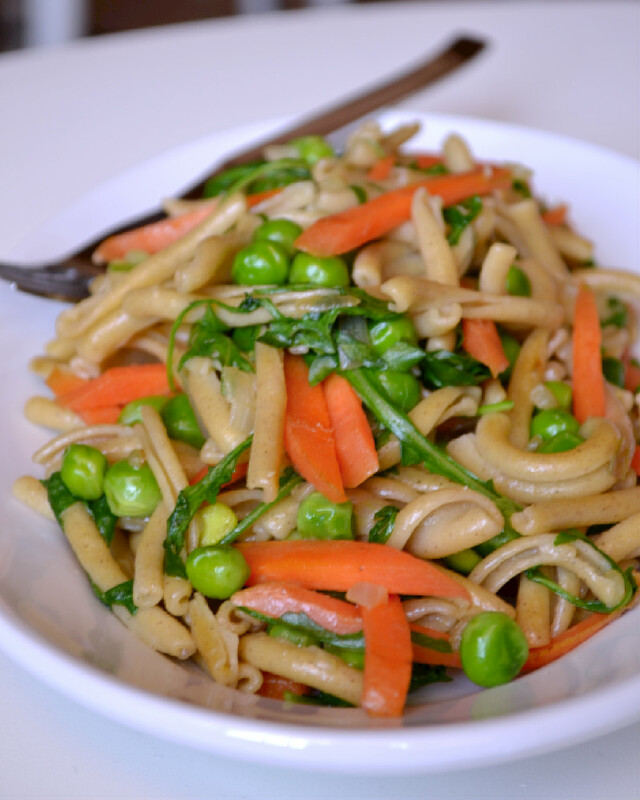 Here is one for you to try, Casarecce with Peas & Carrots (recipe below). Perfect for a quick lunch or weekday dinner. Casarecce meaning “homemade” is a traditional Sicilian pasta shaped like a rolled up tube, making it the perfect pasta for chunky sauces. While I didn’t make a chunky sauce here, it worked well nonetheless. I used a gluten free buckwheat brown rice casarecce that I had picked up at the supermarket out of curiosity. I also tossed in some arugula, another vegetable which thrives in the spring and summer. It added a nice peppery bitter greens flavour which offset the sweetness of the carrots and peas. 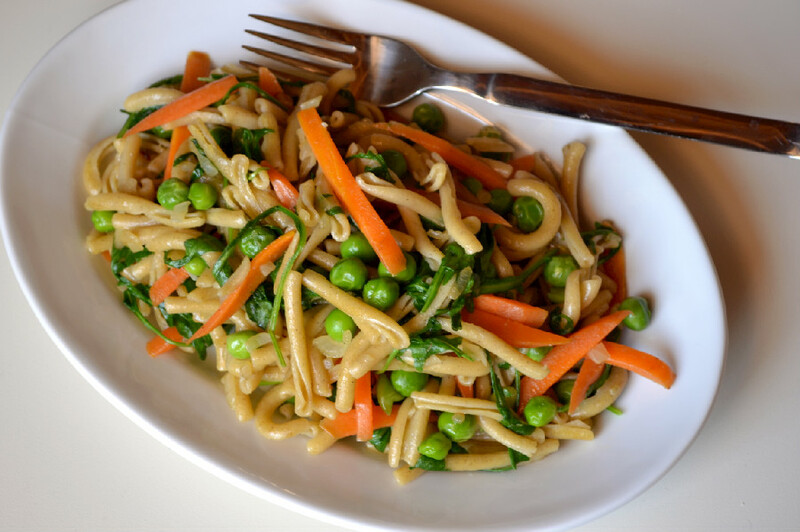 A simple pasta dish with the flavours of primavera! Cook pasta al dente, in salted boiling water, according to package directions. Add peas to pasta in the last 3 minutes to blanch them. Finely dice onion or shallot and crush garlic in a garlic press. Slice carrots into matchsticks. To do this, slice carrots diagonally into thin ovals and then slice each oval lengthwise into matchsticks. Heat olive oil in a pan and add onions and a pinch of salt. Sauté over medium heat, until translucent, about 2-3 minutes. Add garlic and sauté for another minute. Add carrots and sauté for 3-4 minutes until softened but still crunchy. Drain pasta an peas and add to pan with carrots, onion and garlic. Mix well. Add a tablespoon or two of pasta water if needed. Add a handful of arugula and toss to combine. Season with fresh ground black pepper and serve. This recipe is enough for two small servings as a first course to a multiple course meal, or 1 regular serving and a bit of leftovers which can be warmed up or eaten at room temperature as a pasta salad. Love this recipe. Totally up my alley!